I love experimenting with new brunch dishes and for father's day I wanted to create something that was reminiscent of my days living in Mexico. This dish is my interpretation on Eggs Benedict. 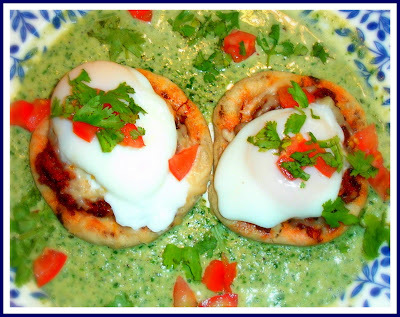 For this recipe instead of the typical muffin used in Eggs Benedict we are using mexican "sopes", mexican chorizo, and roasted poblanos and spinach as a substitute for the hollandaise sauce. There are two ways to make a "sope". You can buy the corn masa and make them from scratch or you can buy them at your local Mexican store, and fried them for 1 minute. I choose to buy them just because I really did not wanted to slave all day in the kitchen. Char chiles directly over gas flame or in broiler until blackened on all sides. Enclose in paper bag 10 minutes. Peel, seed, and thinly slice chiles. Melt butter in medium saucepan over medium heat. Add onion; sauté until soft, about 2 minutes. Add garlic; stir 30 seconds. Stir in flour (mixture may be firm). Sauté 1 minute longer. Whisk in warm milk and bring to boil, whisking constantly. Reduce heat to medium-low; simmer until sauce thickens, whisking occasionally, about 5 minutes. Pour sauce into blender. Add cream, spinach (uncooked), roasted chiles and blend sauce until smooth. Season with salt and pepper. In a heavy skillet cook the chorizo until done. Set aside and keep warm. 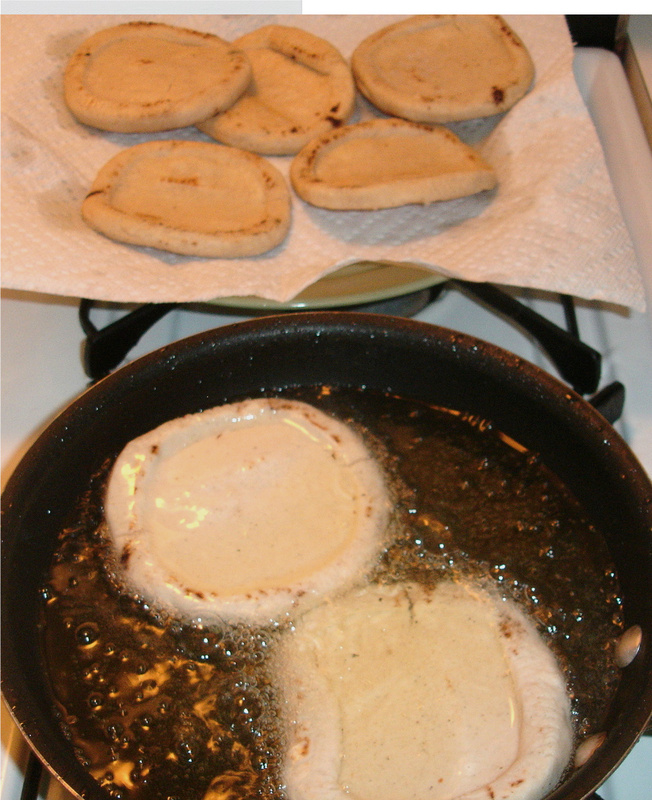 Set skillet over medium-high heat and bring water to simmer. Reduce heat to medium-low. 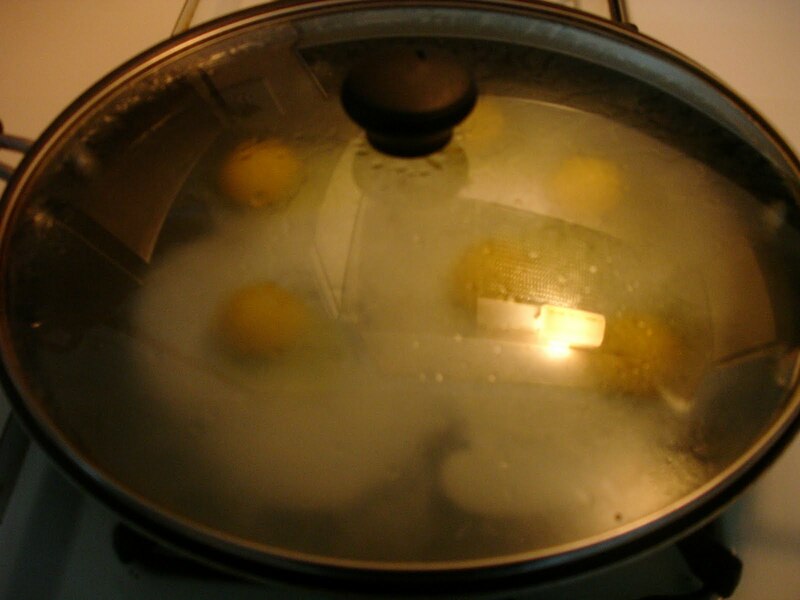 Cover skillet and gently cook eggs until whites are just firm to touch and yolks are set to desired consistency, about 6 minutes.Using spatula and oven mitt or hand towel as aids, lift cups with eggs from water. Cut around eggs to loosen. 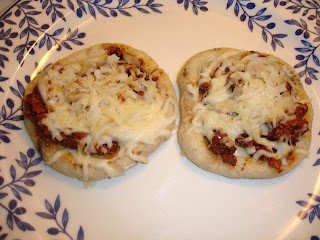 For the assembly place two sopes on each plate. Add chorizo and Manchego cheese. Put plate in the microwave and melt the cheese (around 30 seconds). 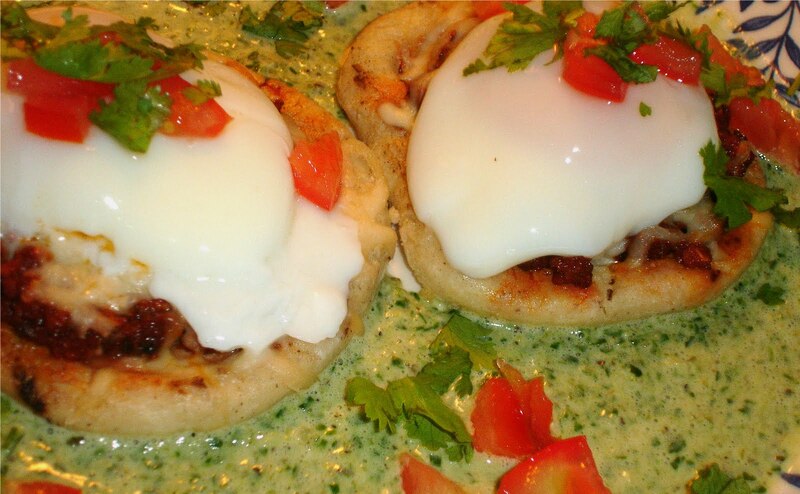 Top the sope with one poached egg. 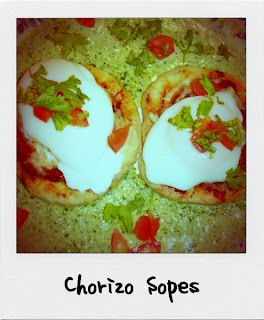 Pour the poblano sauce around the sopes and garnish with diced tomatoes and cilantro.